A real man: What women want to find and boys want to be. from the constant cultural impressions on his impressionable life. If a boy grows up with an absentee or abusive father, his view of manhood can be similarly shaped. If a boy has access to Uncles or coaches or teachers that are caring, he is taught that men should act likewise. If he is heavily influenced by Hollywood’s heroes, a small lad might think that womanizing or fighting or breaking the law is what a real man does. Even men on powerful platforms (politicians, athletes, musicians) can model what men are supposed to say or do. By the time a boy is in his teens, the messages are mixed and can be quite confusing. From their perspective – “Dad says one thing, Uncle Ricky says another and my favorite athlete handles situations completely different from my teacher. Do real men lie or tell the truth? Do they cheat or are they supposed to be faithful? Do they work hard or are they lazy? Are they tough or are they allowed to cry?” These thoughts bounce around a boy’s brain as he tries to figure out what a real man is supposed to look like. By the time a boy is ten, he has seen the full range of male behavior; the good the bad and the ugly – all from adults who are supposed to know better. But, what is a real man? What does he look like? It’s a question that begs an answer. It’s an answer that every boy yearns to learn. And it’s a question whose answer, on a good day, feels largely subjective. From the dozen of men in my life that have left an imprint on my image of manhood (good and bad), I have gathered that a “real man” has the following attributes. Granted, very few men possess all the traits listed below at the same time. Having said that, every man should die trying, not only for their own benefit but because somewhere out there a little boy is looking up to them wondering if they are a real man too. I have the scary privilege of raising two boys in this testosterone deficient world. Though I am not their only male example (Thank God! ), I am a primary one and much of what they glean about manhood will come from my playbook. Like every man on the planet, my boys have seen both a good and bad example from my life. The older I get, the more committed I become to improving that example. As I feel their little eyes on me, I am trying to be more consistent with the message I communicate to them. Trying to get my life to match my lips. This sculpture masterpiece of the Renaissance was created by the Italian artist Michelangelo. The statue represents the Biblical hero David and took him over 2 years to complete. 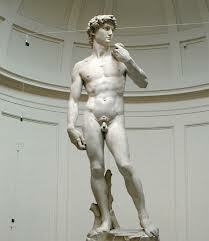 In 1464 an artist by the name of Agostino was commissioned to create a statue of the biblical king, David. A block of marble was provided and Agostino chiseled the legs, feet & torso. For reasons unknown, the project was halted and the half-finished sculpture sat untouched, exposed to the elements for the next 35 years. In 1501, another artist was given the contract to continue the work. In the early hours of September 13th, a twenty-six year old artist named Michelangelo began to chisel an enormous clump of rock. Over the next two years, Michelangelo worked diligently and finally completed one of the greatest pieces of art the world has ever known. As every woman will attest, every man begins like that clump of stone. Some of us stay like that the rest of our lives. Others have some work done on them (ex. legs, feet and torso) and then sit dormant for years. Some of us, after an extended season of inactivity, will have someone enter our lives and (like Michelangelo) begin to sculpt the crude marble into a work of art. The point is, we are all a work in progress. Some are further along than others but all of us need the touch of a divine artist to finish the commissioned work. By God’s grace, even I will one day become the man He’s calling me to be. By God’s grace, the men in your life will too. Until then, we all need more time with the Artist and His chisel. What does a real man look like? This list is a good start. A real man keeps his word, even when it hurts. A real man chooses his words carefully. A real man builds up others. A real man always tells the truth. A real man controls his tongue. A real man encourages others. A real man faces his problems. A real man owns up to his mistakes. A real man can admit his wrongs. A real man faces consequences. A real man can ask for forgiveness when he is wrong. A real man can confront wrong. A real man can show his emotions and share his feelings. A real man is patient with others. A real man is not easily offended. A real man can handle criticism. A real man treats others with respect, especially his elders, women, children and animals. A real man never hits a woman. A real man always looks out for the interest of others. A real man sacrifices for those he loves. A real man protects his family. A real man loves God. A real man honors his parents. A real man loves his wife. A real man controls his temper. A real man loves his children and is an active Dad. A real man is a servant leader. A real man provides for his family. A real man takes care of his house. A real man is a good steward of what has been given to him. A real man is a model citizen. A real man is honest. A real man leads by example. A real man has a strong work ethic. A real man is responsible & dependable. A real man never gives up. A real man is faithful. A real man always does the right thing. A real man is a man of character and integrity. A real man never runs from problems. A real man is confident enough to wear pink. A real man does not do drugs. A real man does not abuse people or substances. A real man can be trusted. A real man is selfless. A real man is under authority and respects authority. Know any real men in your life? Becoming one is more caught than taught. Send them this link and thank them for their example. Better yet, thank the artists that helped them get there.